I wanted to make tunnbröd today. This really thin bread that you roll into wraps. I used to like eating it as a child whenever we had some at home. Anyway, I drafted a recipe that I thought looked good, made the dough and rolled it out. Then I baked it. I don’t know why it went wrong, but the final bread had lots of big air pockets in it and it wasn’t thin enough. 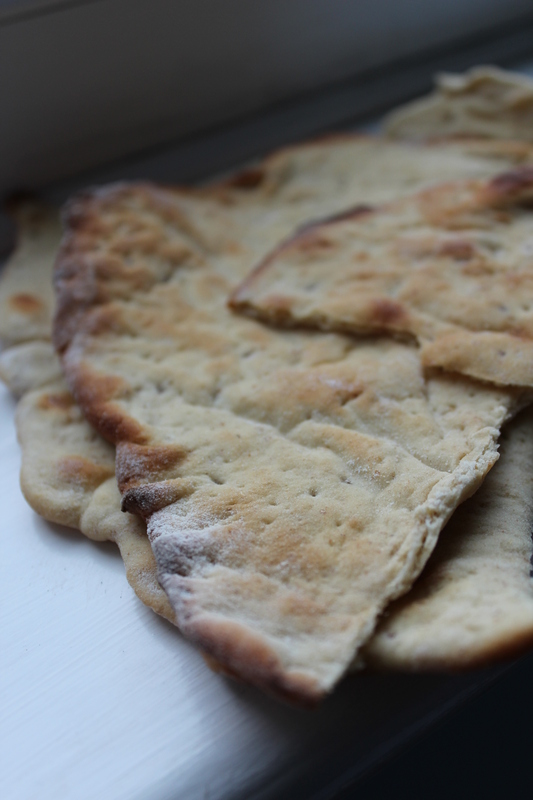 It’s more like a thin, soft pitta bread but instead of a big air pocket it has many of them. Maybe I didn’t prick them enough with the fork? Perhaps if I was more careful to prick them enough the air would escape easier creating more, small holes rather than a few big ones. It’s still a great bread, just not tunnbröd. I guess that with all the bread spices so commonly used in Scandinavian bread and the rye flour you could call it Swedish style flatbread. It’s not what I intended but I might actually make it again. It’s great with butter and ham or some peanut butter and a sliced banana on top. Put the oven on 250 degrees C (225 if you’re using a convection oven). Cube the butter and let it get to room temperature. Put all ingredients apart from the salt in a bowl and use a kitchen machine to knead the dough for about 5 minutes on a slow speed. Add the salt and let the machine run on a faster speed for 3 minutes. Let the dough rest for about an hour to an hour and a half. Divide into 12-14 pieces and shape them into round balls that you roll out with a rolling pin to just a few mm thin. Prick the bread with a fork all over. Bake directly for 2-5 minutes, there’s no need for the bread to rise any more. This entry was posted in Bread and tagged bread, caraway, fennel, flatbread. Bookmark the permalink. ← Summer dreams – Scones with raisins, yoghurt and vanilla.